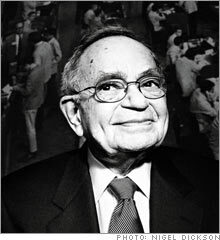 Leo Melamed, godfather of the Chicago mercantile exchange, changed investing forever with financial derivatives. Here's what this market visionary thinks is next. (Fortune Magazine) -- Way back in 1972, the head of the Chicago Mercantile Exchange had a crazy idea: If you could trade futures on pork bellies, wheat and beef, Leo Melamed wondered, why not on Swiss francs or deutsche marks? Or any other financial instrument for that matter? That notion has radically changed the way market risk is managed. And over the last 35 years Melamed - a champion dreamer and born promoter who fled wartime Poland with his parents in 1939 - has helped make the Merc the most valuable financial exchange in the world. The Merc breaks with its agricultural history and becomes the first exchange to offer foreign-currency futures trading. S&P 500-index futures trading begins at the Merc. Index-futures "program trading" on the Merc is partly blamed for the October stock market crash. Melamed disputes the claim. Globex electronic trading platform is added to the old open-outcry system. The Merc becomes the first major U.S. exchange to go public. Merger with Chicago Board of Trade is announced. Under Melamed and his successors, the Merc has been an innovator. It pioneered electronic trading and in December 2002 became the first U.S. exchange to go public. Its stock has since marched from $42.90 to about $518. And the Merc (Charts) has taken a high-profile role in the current wave of market consolidation. In October it announced a deal to merge with its venerable crosstown rival, the Chicago Board of Trade. Melamed, 73, chairman emeritus since 1991, recently sat down to reflect on the revolution he helped make and to talk about where it is all going. How did you get the idea for financial futures? When I took over the Merc in 1969, I found an exchange that was just in the meats. Butter was gone, and eggs weren't trading. And I was deathly afraid that I'd be chairman of a single product exchange. Anything happened to that product, you're out of business. So I was looking around for new products, and I tried everything: I tried turkeys, I tried apples, I tried shrimp, I tried potatoes, I tried oranges. You name it, I tried it, but it was all agriculture. And then, finally, I came to the thought that Bretton Woods, the fixed-exchange-rate system, was coming apart. And when it finally comes apart, wouldn't there be a need for foreign-exchange futures? Our board thought I was crazy, and very frankly I thought it was a little crazy too, because why hadn't anybody else done this? I went to Milton Friedman, though, and he absolutely embraced the idea. So the board had to go along with me. And the minute we went to foreign exchange, I said to the membership that if it works in foreign exchange, the sky is the limit! I was like a kid in a candy store, honest to God. Because in agriculture, where could you go with it? But in finance - ah, look at this! I mean, whoa, anything you want! Do you think the big boom in derivatives is over? The last 30 years witnessed the development of derivatives markets in North America and in Europe, and it took the better part of 30 years. Asia has been lagging in this development, although there were pockets in Singapore and in Korea, and somewhat in Japan. But for the two major parts of Asia, which are China and India, it is just beginning. And China just announced it will open a derivatives market for financial products. It will be opened early next year, and it will be a stock index market. So the growth coming will mostly be from Asia, but it won't take 30 years because everything is so much faster. Is there an overriding reason for all that growth ? We started these markets in 1972, when the risks were very internal, national. But when the economy became increasingly global, those risks multiplied by an unbelievable amount, because now everyone was subject to foreign-exchange risk, now everybody is subject to interest rate risk. Globalization in general created this need for derivatives - they became a global way of doing business and managing the risks of business. And is that why your stock has been so hot? Clearly, business produces volume, and volume produces revenues. That's not to say there's not organic growth. Our options markets are just beginning to come out in foreign exchange, and foreign exchange to me represents the one sector that holds the most promise, not just for Asia but for the rest of the world. And we just launched the housing market and weather futures. Which do you think has the most potential? How can retail investors get in on the action? Well, you know, mostly our markets have been institutional, although retail investors find their way through brokers and hedge funds that use our markets. Should exchanges be publicly traded companies? It makes me a little nervous. I mean, I know we had to do it because we needed the money to be able to invest in technology and build the Merc, but everything has another side to it. I worry about the effect of worrying about the bottom line all the time. A lot of what an exchange has to do is to try things, a lot of which just won't work. An exchange is a very jagged, jagged entity that has 1,000 sides to it, and some of those are not very conscious of the bottom line. Will there be a lot more exchange mergers? I have no question that will continue, but if you were going to ask me whether the end result is one exchange, I don't believe that. First of all I think it's a bad thing, because competition is very necessary. So I'm sure hoping that it's two or three or maybe four. Do you think they'll be one-stop shops? We decided to stick with what we know best, which is derivatives. What the New York Stock Exchange (Charts) is doing is mostly securities, even though by [NYSE's EuroNext acquisition] they would get the London International Financial Futures and Options Exchange, and that would be a small and interesting entry into derivatives. What's made you so interested in markets? It's so hard to psychoanalyze oneself. I lived the early part of my life on the run, from both the Nazis and the KGB. While we were doing this change from country to country, my father, who was a teacher, would always sit me down and explain, "Look, the Lithuanian lit is worth so many rubles." Except he always said remember the official rate isn't really the real rate - you've got to go to the black market to get the real rate. You don't think that had an effect on an 8-year-old as I was traveling and I learned how you transfer one currency to the next? Of course it did. And what are you trading yourself these days?